Julie Nutting Designs: Valentine Classes! Valentine classes are up and running! I know, it's too soon to think about. Everyone is in the countdown mode to Christmas! I will be in San Jose on Jan 6 and 8, at A Work of Heart Studio. 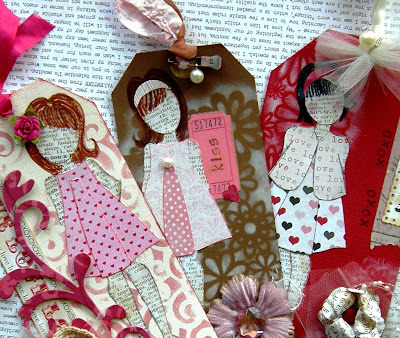 We will be making these darling paper doll tags that are large enough for cards. All materials will be supplied. Other classes will be Jan 14, in Poway at Cool Scrapbook Stuff and Jan 28, at Stamp Your Heart Out in Claremont. I hope to see you there! These are so cute Julie. These are so cute -love them. These really are adorable! An on line class would be fabulous !!! There's no doubt about it, your girlies are certainly such adorable DARLINGS and absolutely gorgeous. I would sooooo love to be able to come to a class. But as I live in France, it's really not possible. I'm loving your fab book and I also would love the change to do an online class or buy a tutorial on line. Is there a chance that you may be able to offer one in the new year? Fingers and toes crossed here that your answer will be YES !!! Thank you again for sharing more of your delightful creations with us. oh my goodness how adorable! I am so excited to meet you, Julie! I am lucky enough to have been able to sign-up for both your classes in Poway; I can hardly wait!!! It's my first time at your blog, exposing to your amazing art. Already subscribed to your blog (google reader) and ordering your book! I was wondering if you have online classes as well - I usually don't like collages but I find your work adorable! Past week i felt in love with these cute fashion girls and draw them my own way and figured out how you made them. I made 5 tags with them and post it on my blog. That weekend I had 3 stampfriends on visit and they all were very exited on them! So each of them made one, also very nice! I bought your book and now....i'm addicted to those great art fashion ladies! Thanks for your inspirational ideas and great book. Your secound book, I'm looking forward to! I saw these DARLING tags on someone's Pinterest board. Since I love making tags and tag cards, these caught my eye. Beautifully done!